At Southern Pharmacy, we enjoy bringing you a unique pharmacy experience through our customized products and services. We want our patients to lead healthy lives and believe it's our job to make that as easy as possible. You already have so many boxes on your "to do" list. Let us check the prescription box for you. 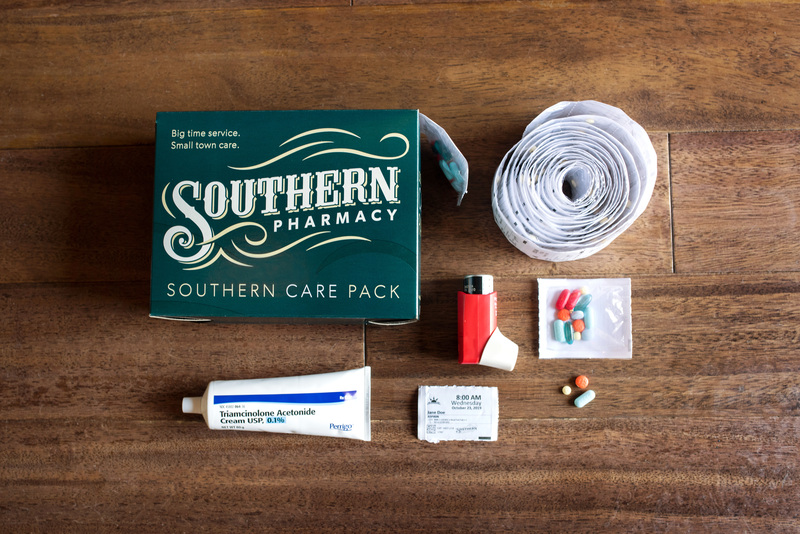 Introducing the Southern Care Pack. A better way to manage your medications. Your meds. Tailored to you. In a pretty box. Turn your pill bottles into one sleek box. Your prescriptions will come packaged by the dose, and each is clearly labeled with the date and time based on when you take them. Patients who are on multiple medications each month will find the greatest satisfaction from our Care Pack. It simplifies your dosage, taking the guesswork out of taking your medications. Plus, it's easy to take on the go! This makes it ideal for patients of all ages and lifestyles. Gone are the days of carrying your pill bottles around and asking yourself "did I take my medication this morning?" Whether you are going on vacation or just have a work day on the go, you can simply tear off the dates and times you need and easily tuck them into your suitcase, purse or briefcase. Prescriptions and OTC's are packaged by the dose. Each packet is labeled with the date and time based on when you take them. If you have medication you don't take on a regular schedule, we'll send it in a separate bottle. We'll fill inhalers, creams, and refrigerated items like insulin. Just give us a call if you need any special items. We know it's not always easy to make a trip to the pharmacy. We have free delivery available in Jonesboro, Lake City, Leachville, Lepanto, Marked Tree and Monette.